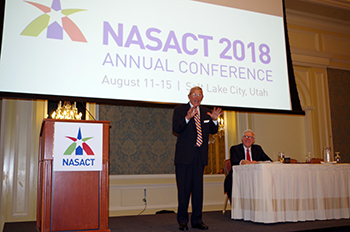 NASACT President Roger Norman, legislative auditor of Arkansas, and our Utah co-hosts, State Auditor John Dougall, Finance Director John Reidhead and State Treasurer David Damschen, welcomed over 400 to Salt Lake City for the association's 103rd annual conference. 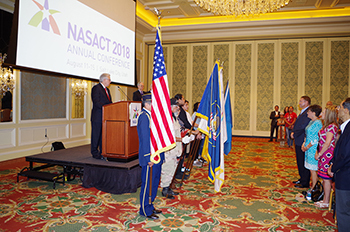 The conference was held August 11-15 at the Grand America Hotel, and included meetings of NASACT's Executive Committee and the Committee on Accounting, Reporting and Auditing. Left to right: Utah State Auditor John Dougall, President Roger Norman, Utah Finance Director John Reidhead and Utah State Treasurer David Damschen. Opening ceremonies featured a presentation of the colors by the Utah Inter-Tribal Veteran's Association. Legendary football coach and ESPN analyst Lou Holtz gave the opening kenote speech. Lindsey Pollak, a New York Times bestselling author, gave the audience some new perspective on how to best tap into the strengths a multi-generational workplace can offer. The conference featured six general sessions, with keynotes from legendary football coach Lou Holtz, New York Times bestselling author Lindsey Pollak, and Overstock.com board director Jonathan Johnson. 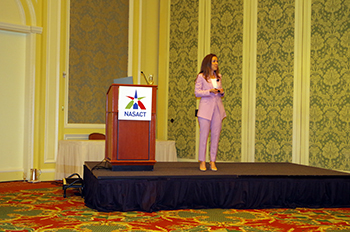 Attendees also heard from the National Governors Association's Scott Pattison and from Kristen Cox, executive director of the Utah Governor's Office of Management and Budget. With 26 concurrent sessions too, the conference featured a wide range of topics of interest to state government financial management leaders. View the complete program (including speaker bios and presentations) here. Two resolutions were approved at the conference during the annual business meeting: thanking President Norman for his service and also commending our Utah hosts. 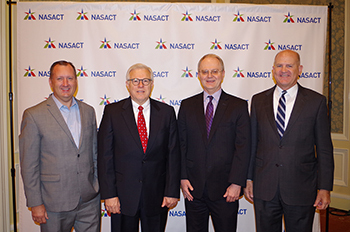 Additionally, NASACT members elected a new Executive Committee. 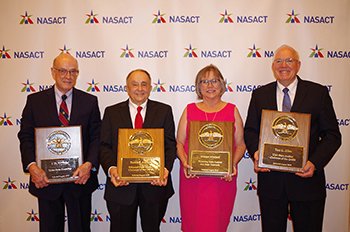 NASACT members elected a new Executive Committee for 2018-19. 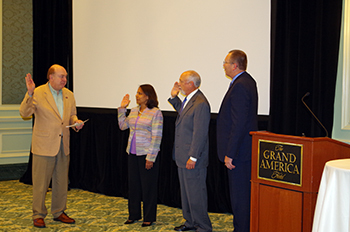 Shown above: David Lillard (TN) administers the Oath of Office to new officers Manju Ganeriwala (VA), Richard Eckstrom (SC) and Clark Partridge (AZ). 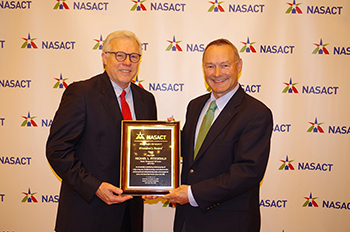 For his first order of business, new NASACT President Clark Partridge (AZ) presented a plaque of appreciation to outgoing President Roger Norman (AR). Hall of Fame inductees (left to right): J.D. Williams, James Antonio, Marti York (accepting on behalf of her grandmother Minnie Mitchell) and Tom Allen. 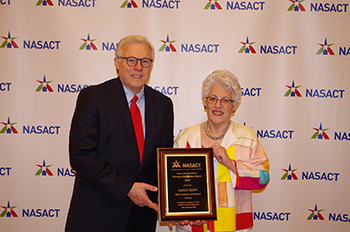 Distinguished Service Award recipient Nancy Kopp with President Roger Norman. 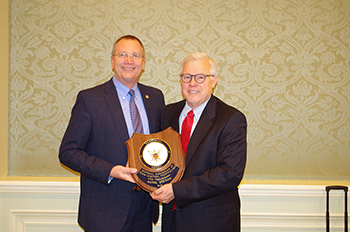 President's Award recipient Mike Fitzgerald (right) with President Roger Norman. President's Award recipient Cynthia Cloud (right) with President Roger Norman. Shad White (right), who accepted a President's Award on behalf of Stacey Pickering, with President Roger Norman. President Roger Norman officiating the awards ceremony on Tuesday, August 14. 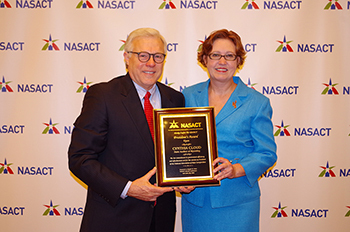 NASACT wishes to thank all those who helped with the conference, including our Utah hosts, speakers and moderators. Special gratitude goes to our corporate partners for their financial support and technical expertise. The 2019 Annual Conference will be hosted by incoming President Clark Partridge, state comptroller of Arizona, in Scottsdale, Arizona, on August 17-21. Mark your calendar and join us next year!